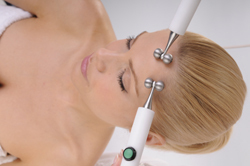 CACI Non-Surgical Facelift uses tiny “micro” currents that stimulate muscle tone and enhance skin tissue. Following a treatment, your facial muscles will feel firmer and your skin will look glowing. The CACI Non-Surgical Facelift treatment helps tighten and tone sagging facial muscles, while smoothing the appearance of fine lines and wrinkles. The treatment produces immediate and dramatic results. CACI works in harmony with the body’s own bio-electrical field. The body works from electrical impulses and the impulses provided by CACI are very similar, therefore the current is virtually sub-sensory. The client feels very little if anything at all. There is no visible muscle contraction, so therefore skin and muscle tissue respond very quickly to this type of stimulation. This deeply relaxing treatment is an overall treatment for the face and neck. Patented microcurrent technology which reeducates the facial muscles, stimulates cellular renewal and softens lines and wrinkles. Provides a visible lift. We use Hexapeptide Serum probes which mimic the ‘botox’ effect. Longer lasting results are obtained with an intensive course. Using patented microcurrent technology from caci international, Jowl lift has been developed to specifically target muscle laxity around the jawline. Helps to improve the appearance of sagging jowls giving instant and progressive results.